This Double Outdoor Papasan Cushion is available in four different designer print fabrics, it is for outdoor use and is water resistant. Use the drop down menu to select the color you would like and the size you will need. The first price shown is for the 48 inch x 62 inch cushion. 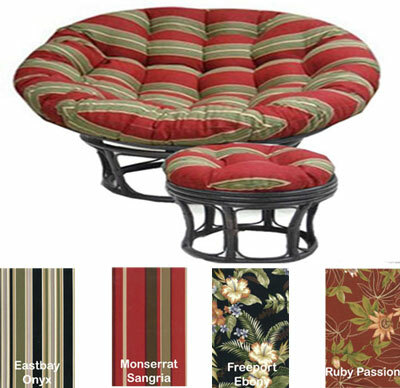 We offer two different custom sizes for our outdoor double papasan cushions. The most common width is 48 inches x 62 inches. The other size available is 58 inches x 78 inches. Simply measure across your present papasan cushion. Please choose your color, size and other options from the drop down menus.